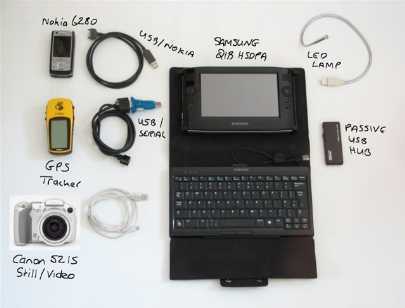 One year ago (see this post for details of the 2007 Solar UMPC tour kit,) I was using the setup below for my mobile blogging and tracking. This year, its a lot simpler. And a lot more powerful. 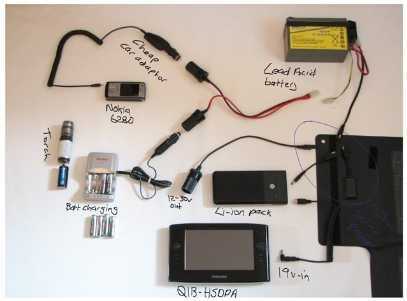 Notice how the phone, GPS tracker and Camera have merged into one device. Yes, the N82 is a real boon. The N82 camera is not as good as the S2 (as expected) but the ability to auto-tag while tracking and then post the images directly to a server over the Internet is a massive advantage. You’ll also notice a change in UMPC. I’m now using the Samsung Q1 Ultra (with XP and HSDPA) which has an SD slot (negating the need for any cables for the camera) and a much brighter, higher resolution screen. I’ve also moved to SSD rather than the traditional, spinning hard drive. Its safer. The keyboard (A Samsung Q1 keyboard) remains the same as there’s still nothing out there that can beat it. You’ll also see the USB LED lamp. Still, a key part of the kit! Now lets look at the solar setup. This is the setup I used a year ago. And this is the setup i’m going to use over the next four days while I go work/camping. I’ve removed the lead acid battery from the kit and am now direct charging the Tablet Kiosk MP3400. It only charges during peak hours (one full charge per 100% sunny day here in mid-summer Germany) where the SLA battery charges during less sunny periods but the amount of energy you get in those few extra hours is minimal. I’ve chosen to drop the SLA battery and use the MP3400 direct on the Sunlinq 25W solar panel. Here’s a post with more detail about using the two together. And a how-to video. I’ll probably post a few solar computing thoughts while I’m away so stay tuned here for more. Weather is looking good! Last year on the Solar UMPC tour. quite as elegant. I currently use an Asus Eee which has a built in SD card slot for the camera pics. An AT&T USB Cellular modem for internet access. Since we camp with vehicles a power invertor recharges everything while we drive between locations. If you live in the US, AltE also offers these versatile foldable solar panels from Global Solar.